What sort of planning can I use Hyper Plan for? How is Hyper Plan licensed? What are the differences between the Home and Professional Editions of Hyper Plan? How much does Hyper Plan cost? How do I upgrade from v2 Home Edition to v2 Professional Edition? What platforms is Hyper Plan available for? Does Hyper Plan work on Windows Terminal Server? Is there a web/iOS/Android version of Hyper Plan? Do I need to uninstall old versions of Hyper Plan before installing a new one? Can I get Hyper Plan on CD? How many plans can I create? Where does Hyper Plan store my data? How do I do 'Save' my plan file? How do I do 'Save as...' my plan file? How do I access my plans from more than one PC/Mac? 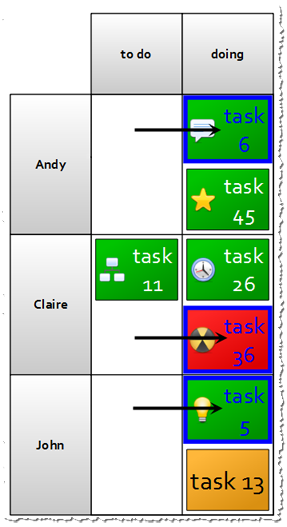 Does Hyper Plan support multiple users simultaneously editing the same plan? How do I show 2 different plans on the same PC/Mac? How do I merge 2 plan files? How many cards can Hyper Plan handle? How do I hide completed cards without deleting them? How do I show cards by date? How do I filter cards by relative dates? How do I show overdue cards? Does Hyper Plan support hierarchies of cards (cards within cards)? How do I create, rename or delete a column (or row) in the 'Cards' pane? How do I hide a column (or row) in the 'Cards' pane? How do I make a column (or row) in the 'Cards' pane visible when it has no cards in it? How do I preserve card rows (or columns) during drag? Can I read data from other applications? How do I import a CSV file into Hyper Plan? Can I edit the output of the Cards/Charts pane in another application? Can I use Hyper Plan to present my plans? Can I print a large plan across multiple pages? Can I run Hyper Plan from a USB memory stick or other portable device? Does Hyper Plan require an Internet connection? What languages is Hyper Plan localized into? Q. What sort of planning can I use Hyper Plan for? A. Pretty much anything where you have discrete tasks or items that you want to visually categorize, prioritize, assign, track or schedule. Including: project planning, event planning, time-tabling, software release planning, sales pipelines, manufacturing scheduling, conference scheduling, staff rosters and lots of other things we haven't thought of! It is also a very easy way to make a pivot table. Q. What platforms is Hyper Plan available for? A. Windows and Mac. See the download page for details of operating system versions supported. Q. How much does Hyper Plan cost? A. Please see the buy page. Q. What are the differences between the Home and Professional Editions of Hyper Plan? Q. How is Hyper Plan licensed? A. The standard license is a perpetual license for a single named user on up to 5 computers (PC and/or Mac). It is also possible to buy an organizational license. Please see the buy page for more details on licensing. A. Absolutely! If you don't have a license key Hyper plan will run as a fully functional trial for 7 days. The 7 days do not have to be consecutive (e.g. it could be 7 days of use spread over a whole month). At the end of the trial you will need to purchase a license to continue to save, print or export your plans. Q. How do I upgrade from v1 to v2? A. If you have a valid v1 license you can purchase a discounted upgrade to v2 here. Q. How do I upgrade from v2 Home Edition to v2 Professional Edition? A. If you have a valid v2 Home edition license you can purchase a discounted upgrade to v2 Professional Edition here. Q. Do I need to uninstall old versions of Hyper Plan before installing a new one? A. No, you can have multiple versions of Hyper Plan installed. Or you can uninstall old versions if you want to. Each installation only uses as much disk space as a few digital photos. Q. Can I get Hyper Plan on CD? A. No, we don't sell CDs. However you can download the installer and burn it onto your own CD. Q. How do I show 2 different plans on the same PC/Mac? On Windows you can just run Hyper Plan twice. On Mac you can duplicate the HyperPlan.app file in the Finder and then run both .app files (or type open -n -a HyperPlan in the terminal). Q. How do I do 'Save' my plan file? A. It is saved automatically. If you want to undo a change, just use Edit>Undo. Q. How do I do 'Save as...' my plan file? Q. How do I merge 2 plan files? Make sure that corresponding properties in the two plans have the same names (case insensitive). Open the the first plan file and File>Export>Table>CSV to create a .csv file. File>Open the second plan file. Select File>Duplicate File... to create a copy of the second plan file. When prompted whether to open the duplicate file click Yes. Select File>Open, change the file type to CSV Files (*.csv) and open the exported CSV file. When prompted whether to import the CSV file into the current plan or create a new plan, choose Current. The new plan file should now be a merger of the 2 original plan files. Q. How do I create, rename or delete a column (or row) in the 'Cards' pane? A. The important thing to remember is that the values of the cards create the rows and columns. 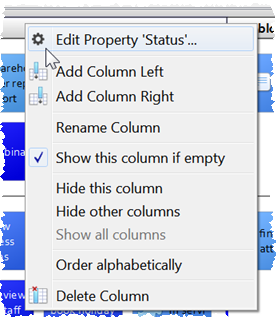 Lets say you have a property status with columns to do, doing and done. To add a new waiting column, just create a new card with status=waiting. To rename the doing column to in progress, just drag a box around all the cards in the doing column and edit their status from doing to in progress. To delete a column, just drag a box around all the cards in the column and Edit>Delete them. If you want the waiting column to always be there (even if there are no cards with status=waiting) then click on the column header to bring up the Property window and add waiting in the Pre-defined values tab. You can also add/rename/delete columns and rows by right-clicking on the column/row header. Q. How do I hide a column (or row) in the 'Cards' pane? 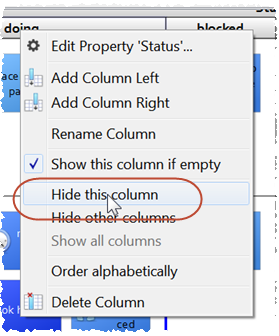 A. Right-click on the column and select Hide this column. To display it again click any column header and select Show all columns. Q. How do I make a column (or row) in the 'Cards' pane visible when it has no cards in it? A. Add the values of the columns (rows) you need visible to the Pre-defined values for the property. Click the Add current values button to add all the existing values. 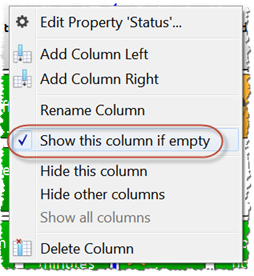 From v2.1.0 you can also right click on a column (row) and select Show this column if empty (Show this row if empty). Q. How do I hide completed cards without deleting them? Add a new property completed with default value no. Bring the Cards pane to the front. Add the current view in Stored Views as all cards. Set Filter to Hide completed Is yes (see below). Add the current view in Stored Views as non-completed cards. 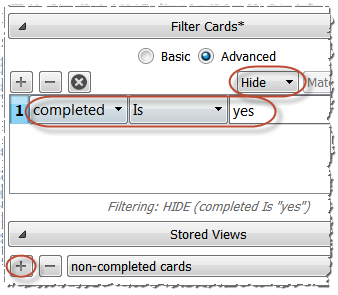 Switch between the two stored views, depending on whether you want to show or hide completed cards. Q. How do I filter cards by relative dates? Q. How do I show cards by date? A. Add a property of type Date. 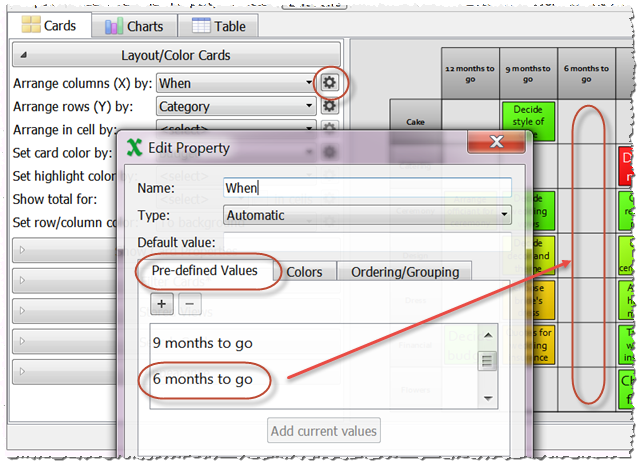 Date values can be in DD-MM-YYYY, MM-DD-YYYY or YYYY-MM-DD formats (depending on the Date format setting in the Preferences window). For example, if the format is DD-MM-YYYY, the following are all valid dates: 31-1-15, 31-Jan-2015, 31/01/2015. To show dates as columns set Arrange columns (X) by to your date property. 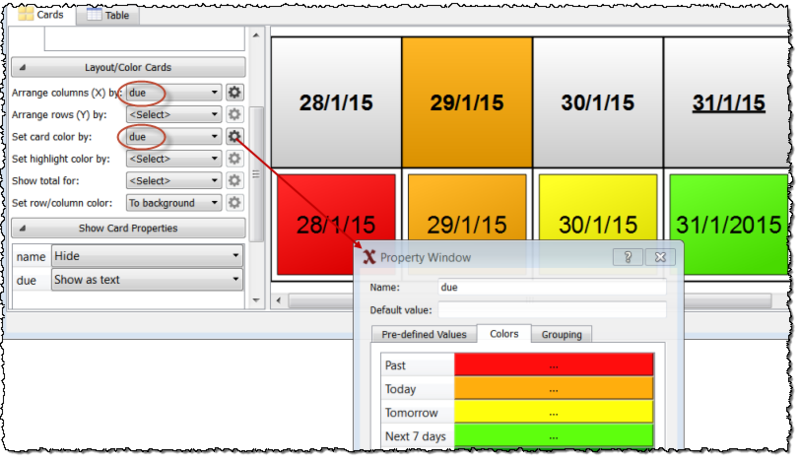 You can set the Bin size to show a column per day, week, month, quarter or year. 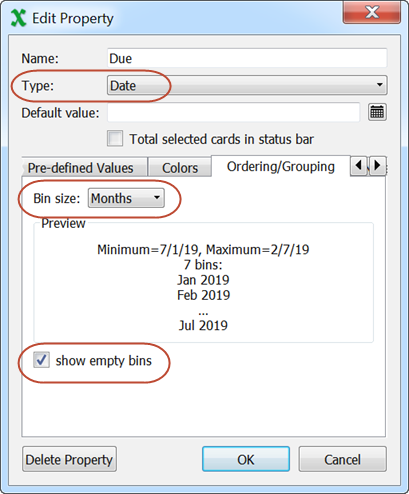 You can also check the show empty bins box to optionally show columns for dates with no cards. See below. Q. How do I show overdue cards? A. You can color code cards by their relative date. E.g. show cards due today as orange and overdue cards as red. You can also layout cards by date. Dates can be in DD-MM-YYYY, MM-DD-YYYY or YYY-MM-DD formats (depending on the Date format setting in the Preferences window). See below. See also How do I filter cards by relative dates?. Q. How do I preserve card rows (or columns) during drag? A. If you are dragging cards in multiple rows and you want to preserve their rows (rather than dragging them all to a single cell), just hold down the Ctrl (Windows)/~Cmd (Mac) key and drag horizontally. Note that the whole column will be highlighted as a visual cue. Similarly to preserve columns, just hold down the Ctrl (Windows)/~Cmd (Mac) key and drag vertically. Q. Does Hyper Plan support hierarchies of cards (cards within cards)? A. Currently no. However you can store a hyperlink to another plan in a card. Clicking on that card will then open Hyper Plan with the hyperlinked plan. The hyperlinked plan will need to be stored on a shared network folder if you want to access it from other computers. 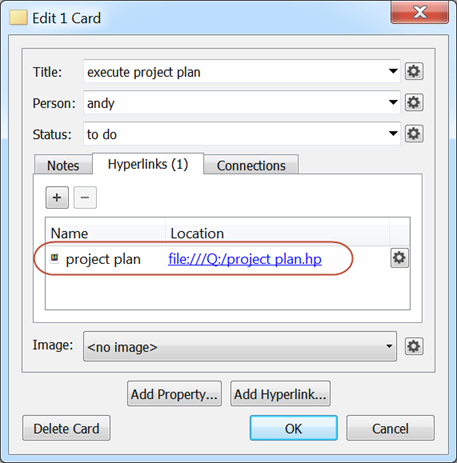 Hyper Plan Professional edition also supports connections between cards, which can be used to model a hierarchy of cards. Q. How many cards can Hyper Plan handle? A. It depends on your computer. There is no hard-wired limit. We have tested it with 40,000 cards, and it still worked! Q. Can I read in data from other applications? A. Yes, Hyper Plan can read in CSV (comma separated value) files. Many applications can export CSV files. Q. Can I use Hyper Plan to present my plans? A. Yes! Please see our notes on how to present your plan. Q. Can I edit the output of the Cards/Charts pane in another application? A. Yes, from Hyper Plan 2.3.0, you can export to SVG format. SVG format can be edited using vector graphics packages such as Inkscape (free) and Abobe Illustrator (commercial). Inkscape seems to have better SVG support. 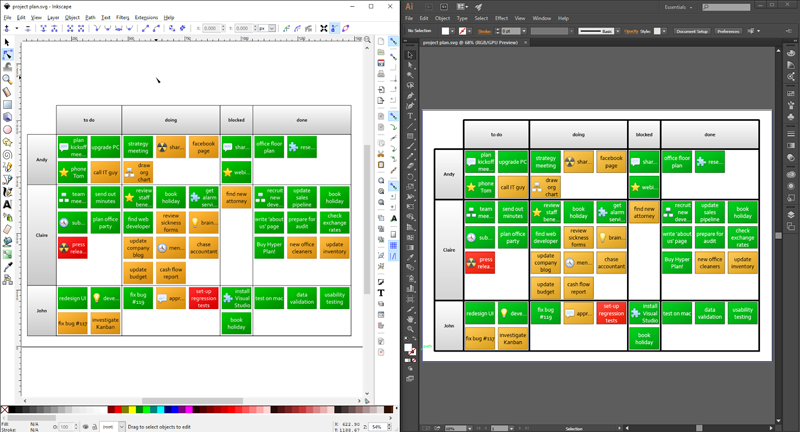 The image below shows an SVG file created by Hyper Plan shown in Inkscape (left) and Adobe Illustrator (right). You can also use Sozi (free) to make presentations from SVG exports. Use of third party software is at your own risk. Q. How do I import a CSV file into Hyper Plan? A. Select File>Open... then select CSV Files (*.csv) from the file type in the file open window. Q. Can I print a large plan across multiple pages? A. Currently Hyper Plan doesn't support printing across multiple sheets. However you can File>Export>PDF to create a PDF file and then use Adobe Acrobat Reader X software to print the PDF across multiple pages. Use of third party software is at your own risk. Q. How do I access my plans from more than one PC/Mac? A. We recommend you either place your plan files in a networked folder or you use DropBox (or the Apple, Google or Microsoft equivalents) to synchronize plan files between multiple devices. DropBox is free for up to 2GB of storage and works really well. Q. Does Hyper Plan support multiple users simultaneously editing the same plan? It locks the plan file while you are writing to it (Windows only). If you try to modify a plan file in the same moment that is locked by another program (e.g. another instance of Hyper Plan), a 'conflict' file will be created with your changes. You can File>Open this file if you want to keep your changes. It detects and loads changes made to your plan file by other people/programs. All the data for a plan is stored in a single plan file. The format is the same on Windows and Mac. This means it can be easily moved between computers and works well with file synchronization systems such as DropBox. From v1.2.0 to v2.5.3 the plan file is locked the whole time it is open (Windows only) unless it is opened as 'read-only'. Q. How many plans can I create? A. There is no hard-wired limit. You are only limited by the amount of disk space on your computer. Q. Where does Hyper Plan store my data? A. It stores it on your local hard disk. This makes it suitable for confidential data, which you might not wish to store on a third party server. If you do want your data to be stored on a third party server (e.g. for back-up or sharing purposes) then you can store your plans in a DropBox folder (or similar). Q. Can I run Hyper Plan from a USB memory stick or other portable device? Install Hyper Plan into an appropriate folder on your portable device, to which you have write permission. Select a portable .ini file for the Store these preferences in field. If you are storing your preferences in a hyperplan.ini file, then Recent files are stored with paths relative to the current executable. This means they should still work for plans stored on the device even after you have moved the device. It is possible to have Windows and Mac versions of Hyper Plan on the same device sharing a single hyperplan.ini file and using whichever executable is appropriate to the host device. Just make sure you install the Windows .exe and Mac .app files into the same folder. On Mac, for reasons we don't understand, you might need to set System Preferences>Security & Privacy>Allow apps downloaded from to Anywhere the first time you run Hyper Plan from a portable drive. Otherwise you may get spurious messages about the application being "damaged". Q. Does Hyper Plan require an Internet connection? A. No. Once you have downloaded and installed Hyper plan, it doesn't require any further Internet access to work. Q. Is there a web/iOS/Android version of Hyper Plan? A. Currently, no. But we may add these, if there is sufficient demand. Q. Does Hyper Plan work on Windows Terminal Server? A. Hyper Plan is a standard Win32 application on Windows and should work without any issues on Terminal Server. We haven't tested it ourselves, but customers have told us it works fine. Q. What languages is Hyper Plan localized into? A. Currently, only English. However it is fully Unicode enabled, so it can handle non-English character sets.